A long lost castle which took pride of place along the Sefton Coast is set to rise again – except this time the building materials are a little different. Six extraordinary structures made of cardboard, tape and community spirit will be created across the Liverpool City Region this summer in what is a cultural first for Sefton and the combined authority. Lost Castles will see hundreds of volunteers work with thousands of cardboard boxes to build monumental castle-inspired structures, some of which will be based on actual medieval forts or historic structures which were in the region at one time. In Sefton, the long lost Miller’s Castle, built in the 19th Century in Bootle, will be reconstructed and put on display in North Park as part of a series of family-fun activities, coinciding with Bootle’s 150th Birthday on August 11. Members of the public – individuals and community groups – are being urged to get involved in the event which is set to take place from July 31 to August 9. Anyone who signs up can help create these magical structures and then join in the fun of toppling them at the end of the weekend. The concept is the brainchild of French artist Olivier Grossetȇte and is the first creative project to take place across the entire city region. Olivier and members of his team will work with people across Merseyside at a number of free workshops which will take place in July and August – these are drop in sessions and people can get involved as much or as little as they like. Find out more by visiting www.lostcastles.co.uk. Cllr Trish Hardy, Sefton Council’s Cabinet Member for Communities and Housing, said: “We are delighted to be part of the Lost Castles project across Merseyside and to see Miller’s Castle recreated will be an incredible sight. “Not many people are aware that Bootle had its very own castle of course. “In 1824 an enterprising businessman called William Miller was able to build a huge castle on the shoreline, aptly named Miller’s Castle. 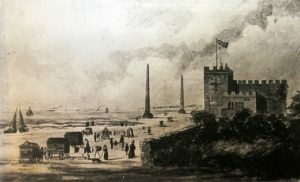 The castle was demolished in the 1860s to make room for the ever expanding Bootle docks and a nearby road, Miller’s Bridge, was named in his honour. “Now Miller’s Castle is set to awe and impress residents and visitors once more when it is recreated in cardboard form at North Park. It will be a magical venue for a series of community events and performances. For more information or to get involved in the Sefton Lost Castles project, visit www.sefton.gov.uk/lostcastles. Additional Needs textile workshop is proving to be sew good!